« How does the Twitter iPhone App animate the current tab bar indicator? Pull-to-refresh in apps like Twitter and Facebook works in a similar way. I’m curious about apps- like Reeder- that allow table view cells to be moved left and right in a table view. In Reeder, a user can “pull” a cell left or right to star it or mark it as unread. Any chance on a recipe on this? I think it’s to hard for me..
Can You give me some clues on how to do it? Any1 has a fix for that? I’d like to add buttons (and later integrate UISwipeGestureRecognizer). Can you please tell what shall I do in this case? 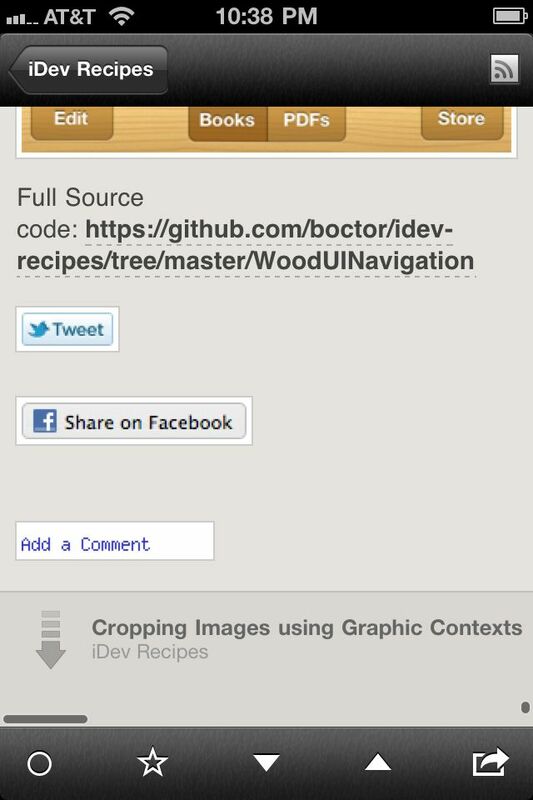 iDev Recipes is a great new site by Peter Boctor that aims to explain how to rcteeare certain features of popular apps in code. The first few posts are really promising. For instance, you can learn how to implement the scroll-down-to-go-to-the-next-article feature found in Reeder. hey, I applied the concept in my project but I did some modification to the codes, in the footer, the arrow is not responding when, I expand a cell in my TableViewCell, the arrow points downwards and doesn’t rotate. When I expand the cell and scroll to the bottom. But when I collapse the cell, the arrow works fine and rotate properly. Any advise? Great example. I would love to see a paper fold effect instead of the arrow to move from previous/next view. Like the new Reeder app does. Any examples would be greatly appreciated. I have some problem to convert this project using arc for my existing project (still newbie)…. Does someone make this translation?